Georgian singer, musician, and composer Brandon Stone will once again delight Azerbaijani fans with a fascinating concert. The event will take place at Baku Musical Academy on April 14, Trend Life reported. New songs and famous hits will sound at the concert. 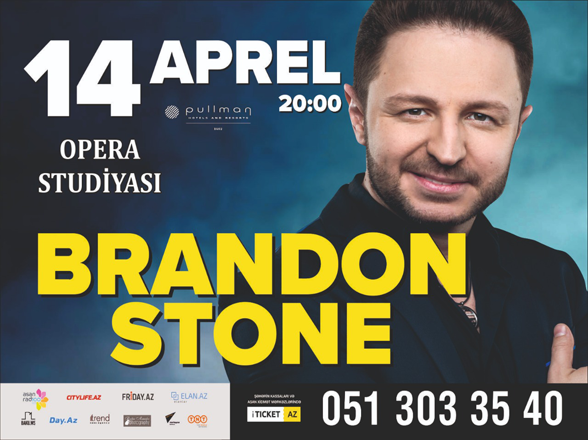 Brandon Stone has already performed with a solo concert in Baku. He also participated at Zhara Summer Music festival. In addition, the singer's two video were filmed in Baku. Brandon Stone was born in Tbilisi. At 11, he won his first competition-Warrington International Festival (England). In 1995, Brandon moved with his family to the U.S. and later - to Germany. In 1997, Brandon entered (Hanns Eisler College or Academy of Music. In 2000, Brandon Stone gained the title of "Singer of the Year" in Georgia. He performed the song "Historia de un Amor" that made him famous. In 2005, he released his first Russian-language album. In 2005, Brandon Stone took part in the New Wave International Contest in Jurmala, where he presented Spain. Talented singer gained popularity in many countries in Europe, the CIS and the U.S.
Brandon sings his songs in Russian, English, German, Spanish, French, Hebrew and Georgian.